I learned at a young age how to bake my own cookies so I could have them whenever I wanted them. I had a peanut butter cookie, a sugar cookie (no icing or pretty sugar sprinkles) and an oatmeal cookie recipe. These were all that I baked back then except when I could talk Mom into a package of chips at the grocery store to bake an occasional chocolate chip cookie recipe. My teachers would tell my class that I knew how to bake cookies and the following day I would bring them in for our class. How times have changed! Much later I learned how to bake cookies using cookie cutters to make shapes from the sugar cookie recipe and top them with icing and colored sugar. I began dusting my peanut butter cookies with powdered sugar to add a special touch. I gradually progressed in my baking to making many different kinds. When my children were young and I lived near the family, I would make hundreds of dozens of cookies for Christmas and pass trays of them out to everyone. I am hoping to gather all my Christmas recipes together before the holiday arrives again. 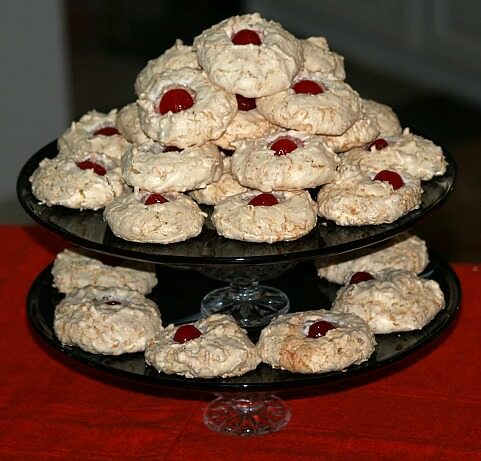 I learned how to bake cookies with filling and ones with meringue which are now among some of my favorites. When I was young, I didn’t really care for coconut. Now I love it, especially in a coconut meringue cookie. 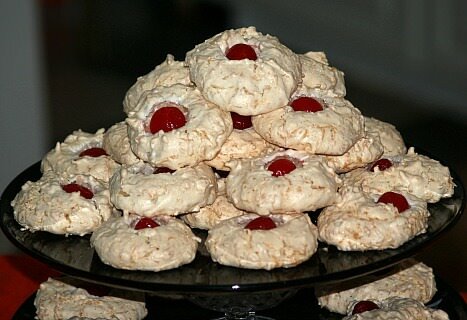 I also make a delicious filled cookie for the holidays with a meringue on top. Beat egg whites until frothy and gradually beat in the sugar. Continue beating with mixer until stiff peaks form. Fold in by hand the salt, vanilla and coconut. Drop by tablespoon onto ungreased brown paper on a baking sheet. Top each with a cherry if you like. Bake about 20 minutes or until lightly browned. Remove entire paper with cookies from pan. Lay a wet towel on the hot cookie tray and return cookies on top of the towel on the pan. The steam will loosen the cookies from the paper. Lift the cookies from the paper to a tray to cool. As with my other baking, I always use top quality ingredients in my cookies. I almost always use all purpose flour in my cookies and always a good brand of butter. The best advice I can offer for you learning how to bake cookies is be sure to measure accurately and follow the instructions. For instance the recommended oven temperature is very important, the blending of ingredients, whether to grease the pan or not to and especially important is you might be instructed to refrigerate the dough before baking. These will all influence the outcome of your product. The cookie baking sheet is another factor you should consider. I prefer a shiny metal baking sheet about ¼ inch deep. I do not like the double layered cookie sheets for individual cookies. They cause the cookies to spread too much. These pans are OK for other baking but not cookies. Cream butter, sugar, vanilla and egg. Add sifted flour and soda and mix well. Shape into balls, roll into sugar and place on a lightly greased baking sheet. Bake for 10 minutes. Remove from tray to cool. Combine and mix cake mix, eggs and oil in a large bowl. Mix M and Ms in with the dough. Drop balls of dough onto lightly greased cookie sheet. Bake 9 to 12 minutes until golden brown; remove from pan and cool. Cream butter with brown sugar; beat in eggs. Sift dry ingredients and add to creamed mixture alternating with sour cream. Roll dough out on floured surface about ¼ inch thick; cut with large fancy cookie cutter. Brush tops with beaten egg whites; sprinkle with sugared ground nuts. Place cookies on greased cookie sheets. Bake ate 350F degrees for 20 to 25 minutes. Beat whites and yolks of eggs separately; add together and beat. Drop by teaspoon on greased cookie sheets; bake 7 minutes at 350F degrees. While still hot roll in powdered sugar; keeps well and flavor gets better. Put soda in applesauce; combine mixture. Sift flour with cinnamon, salt and nutmeg; combine with creamed mixture. Drop by teaspoon on greased cookie sheet; bake at 375F degrees for about 15 minutes. When you learn how to bake cookies you will find the bar cookies to be very quick to make. To make crust combine sugar, butter and vanilla in mixing bowl and cream until light. Spread dough in 9X13 inch baking pan; bake for 15 minutes and COOL. INCREASE HEAT to 400F degrees. Carefully spread jam over baked crust. In mixing bowl beat egg whites with almond extract until soft peaks form. Gradually add powdered sugar to whites. (Mixture will be glaze consistency). 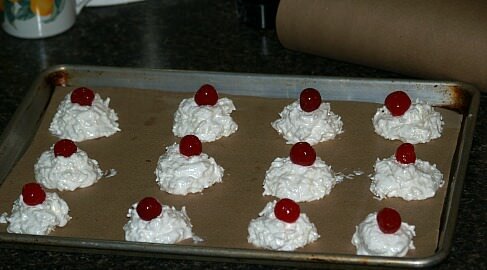 Spread egg white mixture over jam; sprinkle with almonds. Bake for 20 minutes or until lightly browned; cut into bars while warm.